I’m in love with long, shiny, silky and - most of all - healthy hair! I say “yes” to light and wavy hair and “no” to split ends and damaged hair. This is why I have lately engaged with the strong care of my hair. As a woman who is a super-fan of changes and experiments with various hair lengths, I represented the “short hair, don’t care” slogan last year. I had my hair cut very short and with bangs – with no hair dyes at all!-. It was a totally new “me” but I didn’t push it away. Instead, I embraced it with enthusiasm, knowing that in this way, I could refresh my hair, bringing my natural hair color back too. But this was just the preparation stage for my final goal: GROWING MY HAIR. My goal was to reach the perfect hair length as fast as possible and at the same time, keep my hair beautiful. It sounds wonderful, right? However, I knew from the start that it wasn’t going to be easy and my hair would be damaged due to the intense way of living and the unstoppable travelling I do. Just consider the pollution, the climate changes and styling products that are first on my daily list. So, you imagine that I was aware of the fact that the longer my hair was, the more it would be “harmed”. In practice though, this process wasn’t so pessimistic as it seemed. This is because I had by side two powerful supporters: the family of Kérastase and my hairdresser, Stamatis Karaiskos, who is the Ambassador of the brand in Greece and the owner of my favorite place on earth, Sadhu Hair. You already know that I share with you my hair changes by Stamatis on my INSTAGRAM account. The question is: Was it easy to make my hair grow? 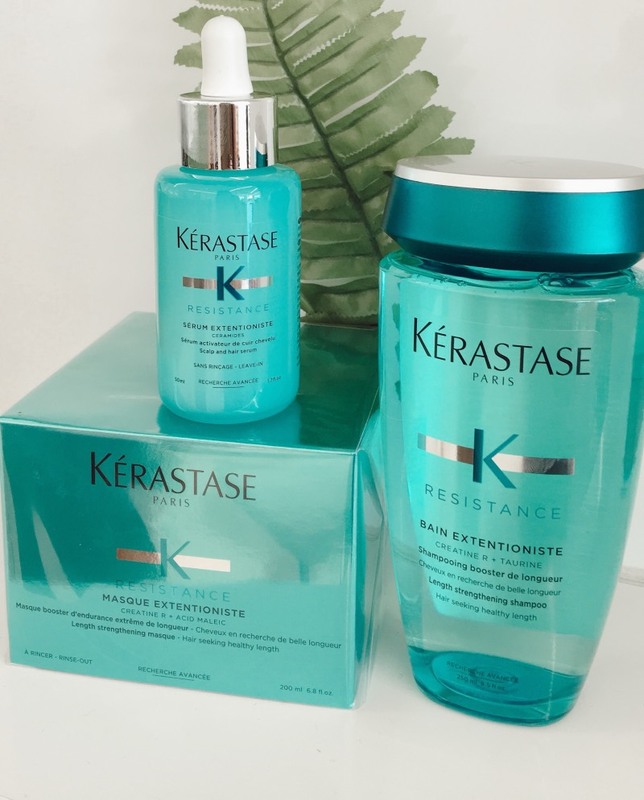 This summer, just before my Epic Road Trip in the USA, I started a personalized hair strengthening program with the Résistance Extentioniste line; a new hair care collection, especially designed to boost the beauty of your hair. It is not a simple hair treatment, but more, an exercise-like hair program to three main points: the root, the shags and hair tips. DAY 1: The #LongHair process started in the middle of June at Sadhu where Stamatis or my hair coach – yes, you can call him that way- put the Kérastase Extentioniste Protocol into practice. The “training” started with my hair strengthening, strong repair and preparation. Together with Stamatis, we set the goal for my dreamy hair length. At this point, my hair length was 42,5cm. WEEKS 1-8: So, I followed a strengthening program both at home and during my trips, using exclusively the Résistance Extentioniste line. It contains three amazing products: The Bain Extentioniste shampoo which is enriched with taurine in order to “wake up” the scalp and the hair, the CREATINE RTM mask and maleic acid to empower the lengths and hair trips as well as the Sérum to make the hair stronger even from the root. Two months later, I paid another visit to Sadhu Hair to refollow the hair protocol and to get my results estimated, with a tape measure. At this point, two months later, my hair length was 46cm. My hair was 3,5cm longer! DAY 90: Three months after the implementation of Résistance Extentioniste Protocol, my hair was 4,5 cm longer. It even surpassed the initial promise of the brand with a half cm longer! My hairdresser’s estimation was complete and of course, positive: 99% less broken hair tips and 78% less split ends!